Encouraging St Mary's students to take a proactive approach to their mental and physical fitness is important and so too is the schools support of Tackle Your Feelings, writes IRUPA's Richard McElwee. For fans of a certain vintage, Donnybrook will always be the home of Leinster Rugby. Hatted and hooded of a Friday night, ignorant of the bitter wind sweeping through from the Wesley end, it was here that the hardened supporter first assessed whether the likes of Brian O'Driscoll would ever make it in the game as they sipped on a hot whiskey. Sadly, it was the draw of O'Driscoll, Horgan et al. that ultimately sounded the death knell for the stadium. The burgeoning success of the provincial side meant that the rusty turnstiles could no longer accommodate the crowds. As the Leinster fanbase began to flourish, the old sodden ground was to be found idle in the echoes of cheers from the RDS. But from time to time, Donnybrook bursts back into life as boys from throughout the province descend on Dublin 4 to cheer on their school team. This year, one of those teams has a very important message that they want to share. 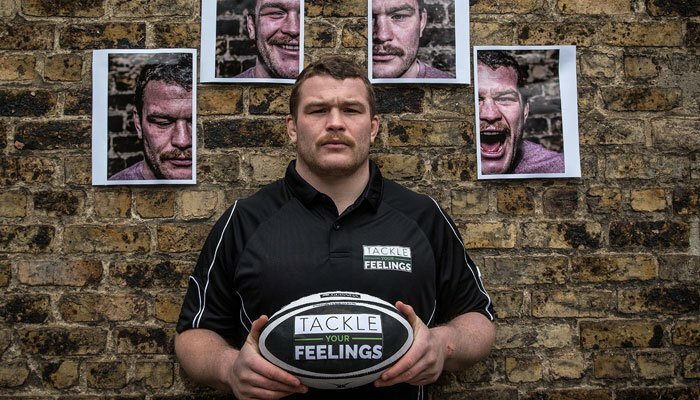 Last year a former pupil of St. Mary's College stepped forward to share his story for IRUPA's Tackle Your Feelings campaign in partnership with Zurich. When they took to the field against Newbridge College on Wednesday, the Senior Cup team of the Rathmines school demonstrated that they are standing shoulder to shoulder with Jack McGrath. "When we put the idea of carrying the Tackle Your Feeling logo to the senior leadership team, they were very keen to be involved and to do something," asserts Barry Leonard, the School Deputy Principal. "This is a visible way for our players to support an initiative they believe in. The Tackle Your Feelings campaign means that no problem is too small to talk about and that's the message that we're getting out. It's better to tackle those feelings." Having launched the campaign in the school and following the respective contributions of McGrath and Shane Jennings, both former stars of the St. Mary's SCT, the pupils have been very much aware of the campaign which seeks to increase the number of people who proactively work on their mental well-being. "Supporting mental health and mental fitness is something that is very much part of the conversation around our school," Leonard continues. "Along with physical fitness it is something that we promote from the senior boys right down to the junior school. It's an exciting period for us as we face into the cup season, as it is for Jack facing into the Six Nations. It's great that we can link into IRUPA at this time and maybe we're starting something that might grow, because when you can support something so positive and can do it so easily, it just makes sense." As an ambassador for the campaign, McGrath was humbled by the support shown by his alma mater. "It's great that they are willing to share what is such an important message. For any young lad, the Senior Cup team are significant role models and by their willingness to get behind the initiative, they are showing that rugby doesn't have to be defined by physicality and aggression. It is a significant milestone in their young lives and I hope that they will always remember the Tackle Your Feelings message." Given the contributions of McGrath, Jennings and Johnny Sexton to player welfare in Ireland, St. Mary's have played a very prominent part in Ireland being the best place in the world to play rugby. Leonard agrees: "I think it's just something our lads do. We're very proud of the achievements and potential of all our pupils and past pupils, from Shane, Jonathan and Jack through to Niall McEniff (SCT captain). Whether it's on the rugby field or in any walk of life we're very lucky, as a school and community, with the calibre of guys that graduate from St. Mary's. Richard McElwee is the Media and Communications Manager at IRUPA and also manages the PR and communicative aspects of the Tackle Your Feelings campaign. An accredited journalist, he is a regular contributor to several sporting websites and publications.